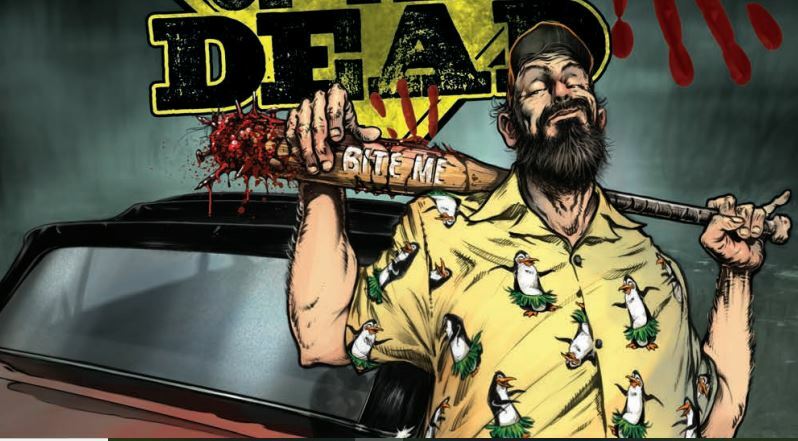 Road of the Dead: Highway to Hell #2 review – AiPT! Road of the Dead #2 stumbles at times, but is an entertaining zombie tale. I’m gonna push on. This is a three issue series, there’s zombies, and killer art work. It has to get better, right? They got the blood on the asphalt right: there’s plenty of it. Basically, this is a road trip story. We’ve all seen it done before: Take a VIP from point A to point B and victory is yours. Victory here is the antidote to cure people who have been infected thus turning them into zombies. Our heroes ran slam into a blockade full of bad motor scooters at the end of the first issue. It is all over the news that a scientist has the cure and these guys want first crack at her. A tank is fired, melees ensue, and chaos erupts as the sides go to battle. A new player enters the battlefield driving a ’67 Pontiac just in time to save the scientist and send the violent bikers running for their lives. All is well for now, or is it? Road of the Dead improves with this issue. The first page catches up new readers with a summary of the events thus far. In fact, I thought the recap sounded better than the actual first issue. The characters are cliche, but it works. The pacing is much faster and a lot smoother than the previous issue. The introduction of new characters is predictable, but ironically enough, it too works. The artwork continues to steal the spotlight in Road of the Dead. Drew Moss can whip up some evil looking zombies and some menacing looking dudes. The scenery looks like a wasteland and adds to the grim atmosphere. Add Jay Fotos’ brutal reds painting the pages with violence and you have a striking visual ballet of blood, bullets, and chaos. The story is still by-the-numbers. I said earlier this has been seen before and unfortunately there hasn’t been any new elements introduced into the narrative. The characters are still road tripping in efforts of delivering the scientist. There is only one issue remaining and I highly doubt there will be some written miracle that will save the tale. Just buckle up and enjoy the blood and gore. R.I.P. 67′ Pontiac. You deserved better, but did your duty. This series is only three issues. Despite the simple plot, the artwork is awesome and will keep your attention for sure. I still suggest waiting for the trade to come out, but if your pull list is light this week, go ahead and snag yourself a copy. Better than the first issue but still missing that something special to make it stand out from other zombie tales. The pacing picks up and carries the story right along. Story is cliche but the action keeps things interesting. Drew Moss and Jay Fotos artwork is ace once again. Plot has been done more than once. Nothing new to the table. Characters are one-dimensional. I don't care who lives or dies at this point.